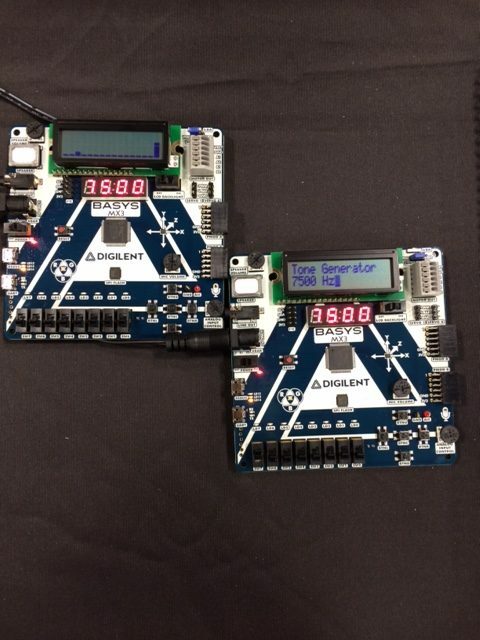 At ECEDHA 2017, we debuted the Basys MX3, our newest microcontroller board built exclusively for education, and specifically for teaching embedded systems related courses. Back then (March 2017) the board was “coming soon” and the associated coursework was still experiencing the final touches. Now, we’re excited to say that the Basys MX3 has fully spread its wings and will be on the expo floor showing off what it can do! 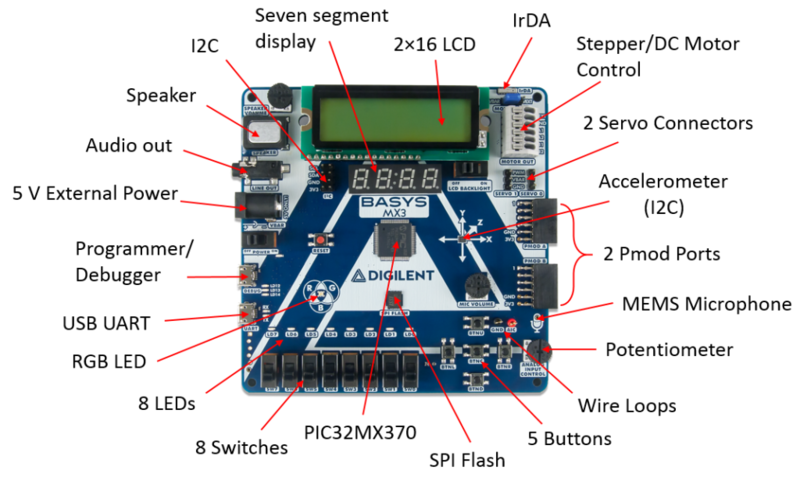 Here’s an overview of the Basys MX3 demos we are showing. Walkaround of the peripherals on the Basys MX3. 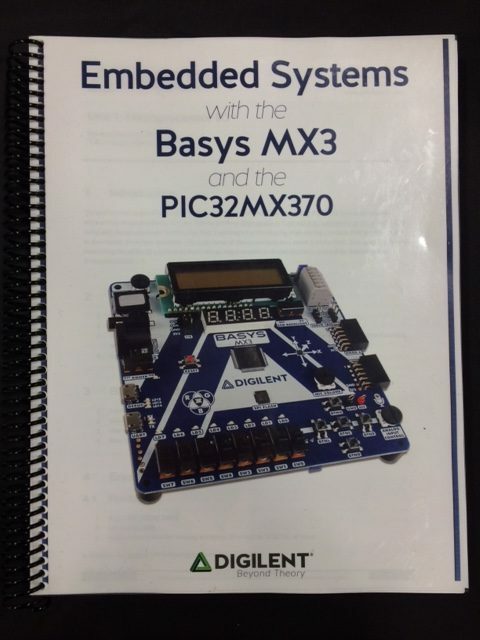 As mentioned above, the Basys MX3 comes with a complete coursework titled, “Embedded Systems with PIC32MX370 and Basys MX3.” This coursework is comprised of in-depth lecture material as well as 15 labs that complete a full walkaround of the extensive onboard peripherals pictured above. We’ve got a printout of the material available for perusing on the table at the Digilent booth! Come thumb through the Basys MX3 coursework material at our booth! 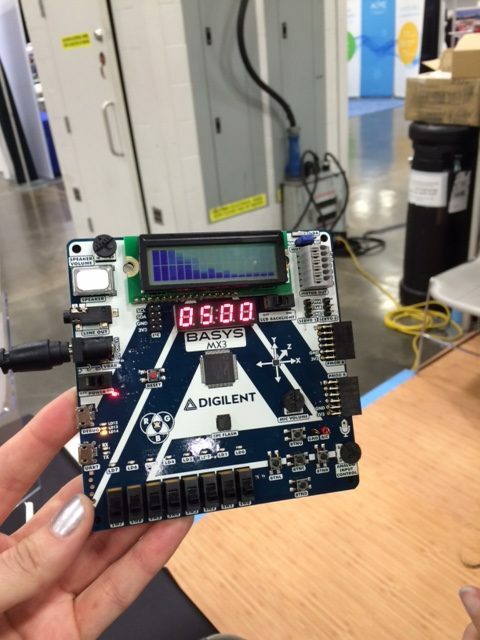 The demos we are showing at the Digilent booth (booth #217) pull from the two culminating labs of the 15 lab series, introduction to digital signal processing! The last lab of the series (Lab 7b) results in students creating a spectrum analyzer using the onboard microphone, seven segment display and character LCD. Basys MX3 displaying a spectrum analyzer. Not pictured here, Kaitlyn blowing into the microphone to create some white noise. 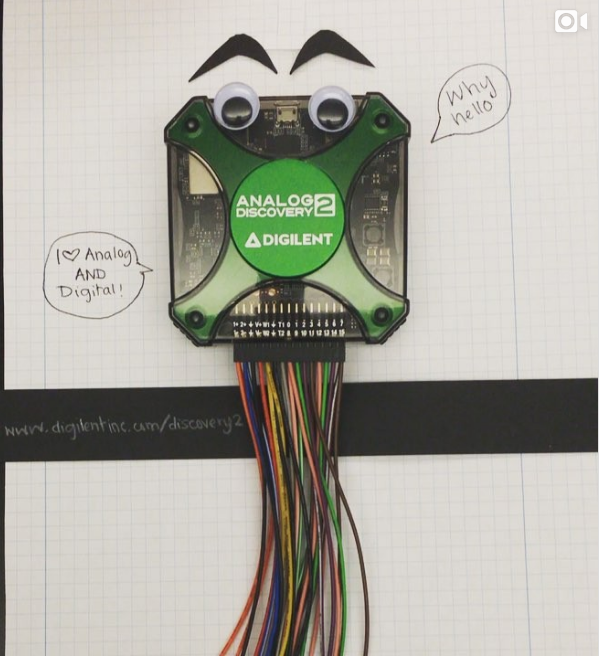 Students are challenged to read analog data from the Basys MX3 microphone, process this data with a Discrete Fourier Transform, and then use the character LCD to dislay the data graphically as well as display the dominant frequency on the seven segment display. The second Basys MX3 on the table is running the second to last lab of the series (Lab 7a) which produces a single frequency sine wave over the onboard speaker. 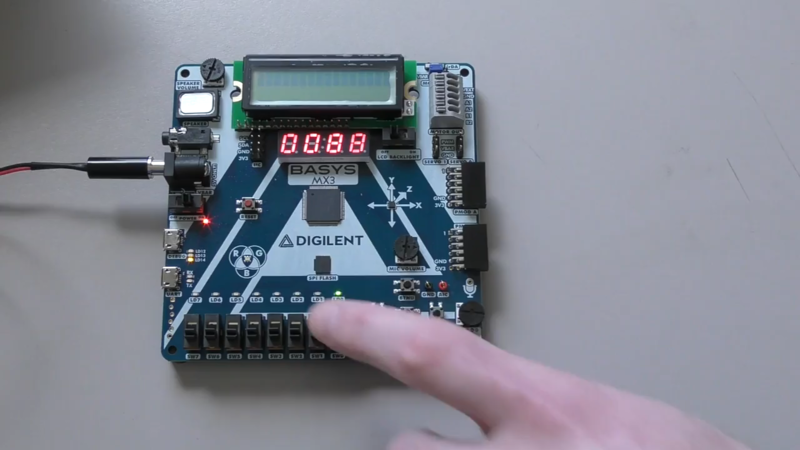 Here students are challenged to use a programmable IIR filter and PWM to generate a single frequency sine wave over the onboard speaker while displaying the frequency of the synthesized sine wave on the LCD and seven segment display. Using the onboard switches and buttons, the desired frequency can be selected and produced. Basys MX3 on the right generating a single frequency sine wave of 7500 Hz and another Basys MX3 on the left picking up a dominant frequency of 7500 Hz through the microphone and displaying on spectrum analyzer. 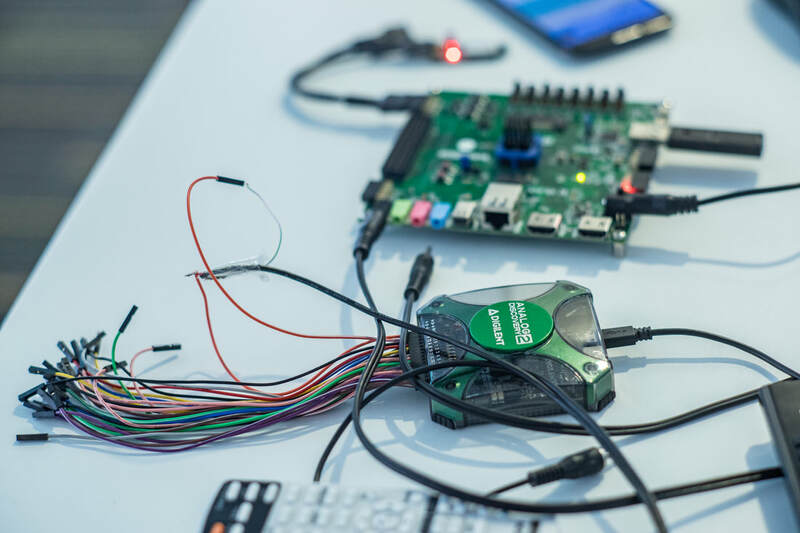 Running these two programs together allows the user to generate a single frequency sine wave on one board and see the graphical output displayed on the spectrum analyzer running on the second board! If you’re interested in these demos, or to learn more about using the Basys MX3 in your classroom, come see us at booth 217! For any questions or comments, please post in the comment section below or visit the Digilent Forum! Previous Article It’s That Time of Year- ASEE 2017! Next Article Red, White and Blue Sale!